The Devinyl Splits series is continuing on with Devinyl Splits No. 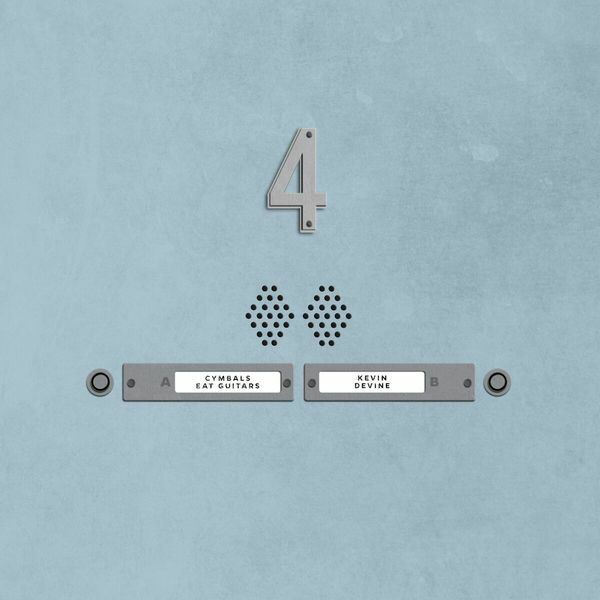 4: Cymbals Eat Guitars x Kevin Devine. This installment of the series is due out on November 13; on this page, you can pick up the 7" on Light Blue vinyl. All 7"s will come with a digital download code to be delivered before the release date, and we have past installments of the split series available here for purchase as well. Wondering what the Devinyl Splits series is, exactly? Here ya go. Want to own this split digitally? That's over here. From the UK or Europe and looking to pick this up with cheaper shipping? Right here. Cymbals Eats Guitars contributes "Aerobed," their first new song since the 2014 release of their full-length LOSE. You can stream that song now via SPIN. Meanwhile, Kevin Devine offers up "Magic Magnet," which is his first new full-band song since 2013's Bubblegum. Note: If you ordered the Devinyl Splits subscription – whether it was for the exclusive splatter variant for all six splits, or the subscription for the solid variants for Splits 2-6, you'll be receiving a copy of this already! Check yr inbox for more updates.